What a Treat! – Must. Write. Or else. As a treat to my lazy and procrastinating self, I am joining The Daily Post’s Photo Challenge this week, with the theme, TREAT! Here, the husband looks absolutely happy eating his tarragon bread. Well, he was really that happy because he’s literally Bread Guy and I’m Ice Cream Girl. On October 14, my birthday, after a long day of touring Tagbilaran City – riding a bugcar to see a little portion of the Chocolate Hills, mingling with butterflies with unusual but beautiful colors and wing patterns, playing hide-and-seek with introverted tarsiers, and buying pasalubong – we decided to cap the day with a visit to Bohol Bee Farm. I’ve only heard of the place through the internet. I didn’t know what to expect except for the bees, and the delicious organic food that they served. Our tour driver dropped us off at the farm only to find no one to welcome us, which was so different from the other places we’ve been to. Since we were tired and were carrying lots of stuff, we entered the shop first, which basically smelled of molds. I thought, hey, organic, remember? While it seemed like a shop with no dine-in facilities, we magically found 1 table and two chairs neatly tucked across the organic chips gondola. Alas! We’ve found our place – we decided to skip the tour and just fill our tummies with what we could find. Because I knew Jets liked bread, I wanted to buy all kinds of bread for him – they had camote/yam bread, squash bread, carrot bread, malunggay bread aside from the tarragon – because they were not at all pricey compared to how big each piece of bread was. The tarragon bread just cost us a good P13.00, and it was enough to keep him from starvation. 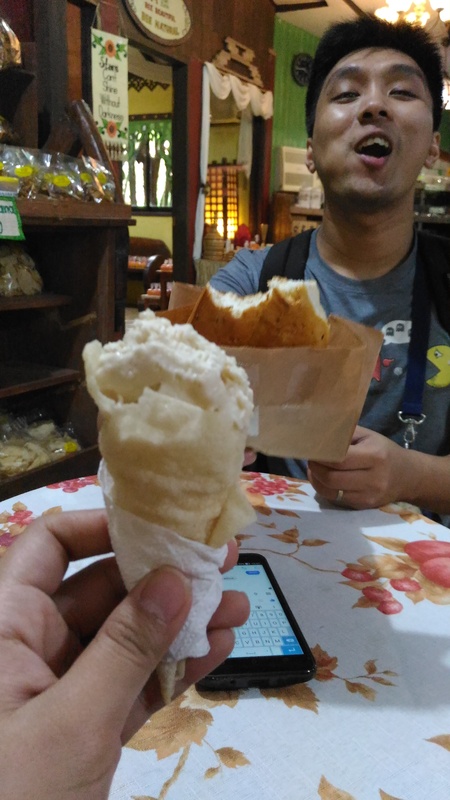 Following a friend’s suggestion and being an ice cream fanatic, I opted for the spicy ginger ice cream in organic cone. It tasted exactly like spicy ginger. The funny thing was I enjoyed it. I even liked the cone, which had more of a kropeck texture than an ice cream cone. With this I came up with a conclusion about myself: I can eat the food I hate the most if it’s in the form of ice cream.